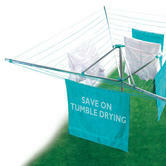 Save money on tumble drying and look after the environment with this outdoor clothes airer. 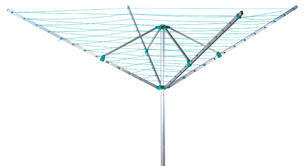 Made from aluminium with PVC lines, it is strong and durable, so you can leave your washing outside and be confident that it will not end up on the floor. 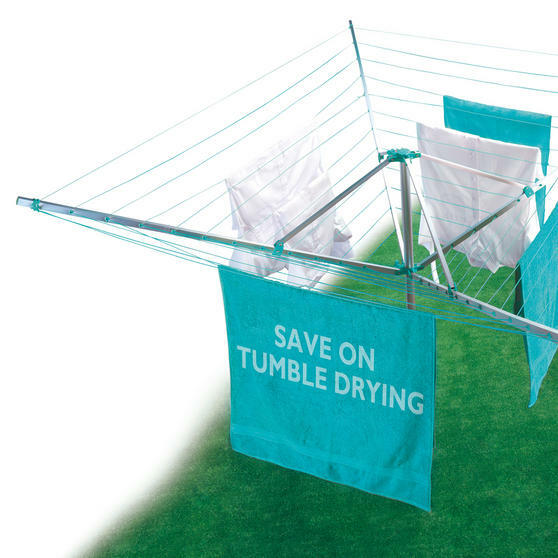 With a generous 50 metres of drying space, you can use it for clothes, towels, bedding and more, with enough room to hang your whole load of laundry. The airer will rotate in the breeze, drying your clothes equally and giving them a lovely fresh smell. Made from durable aluminium, the airer is strong and secure, able to hold a large amount of weight and look after your laundry. The clothes airer measures 190l x 190w x 190h cm and has a huge 50m of drying space, so you can air your whole load of laundry at once.